Getting Outside as Much as we Can! During the month of September, I’m challenging myself to get outside and play everyday. I’m looking forward to 30 days of fun come rain or shine. I’ve always like the concept of the 30 day challenge – you decide on an activity to do each day and then do that activity every day for 30 days. I’ve heard it is a great way to get motivated, try a new habit, or get focused on a new project. The problem is, every time I start a challenge, it never works out that I finish one. I can’t seem to persevere through doing something I choose each day for 30 days straight. Life, wine, weather or some other excuse always happens. Last year, I started with a goal to run every day. 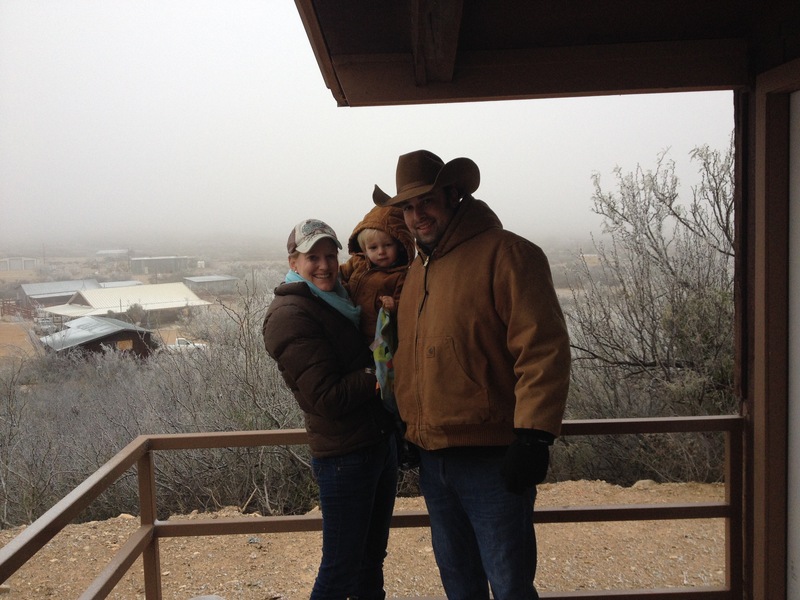 Two days into running it snowed and was 20 degrees in West Texas. At that point, bundling up around the fire pit with bourbon spiked hot tea sounded like a more fun way to spend the morning. One month, I wanted to do a 5k a day (trying to get back on target on running 500 miles in one year) but then torrential rains for 20+ days came. Each time I didn’t meet my goal, I was frustrated and thought this type of challenge was not for me. But as I thought about each monthly attempt, I noticed that having the goal did help me do something, it helped me do more of what I wanted to do that month. I ran more in January and May than I would have without the challenge. I thought, maybe there is a benefit to giving myself a goal of a 30 day challenge even if I only make it 15 days….that’s 5 or 10 more days than I might have done minus the challenge. So, this September, I’m going back to the 30 day challenge. Whether it’s a walk around the neighborhood or one last swim in the pool, I’m going to enjoy being outside for this last part of summer and kick off into fall. Will you join me? (I’ve also hear sharing your goal with others is a good way to meet your goal). A big highlight of our summer so far has been watching our backyard grow into a native landscape. My husband’s new hobby is yard work and the process started right after our little girl was born. He actually was going to till up the backyard the same day she was born, but luckily decided to wait until the next weekend. 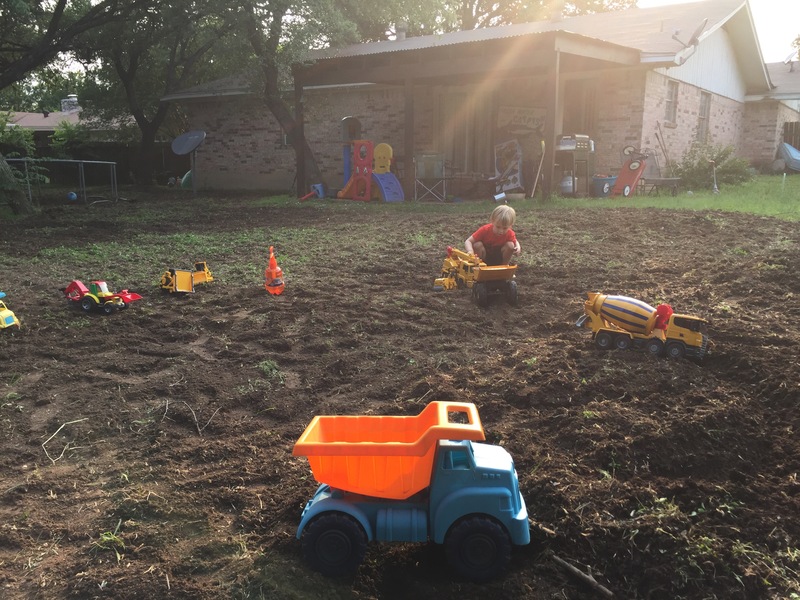 We ordered a variety of native grass mixes from Native American Seed, a great company located in Junction, Texas and set out a plan to get the seeds in the ground and take advantage of the large amount of rain in the forecast. 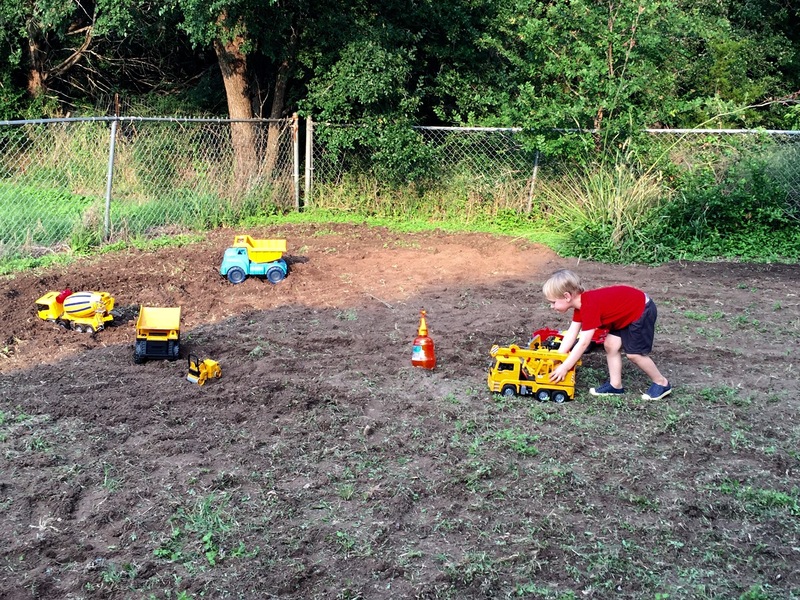 The first step was to till the entire backyard, which turned it into a construction site for a few days. 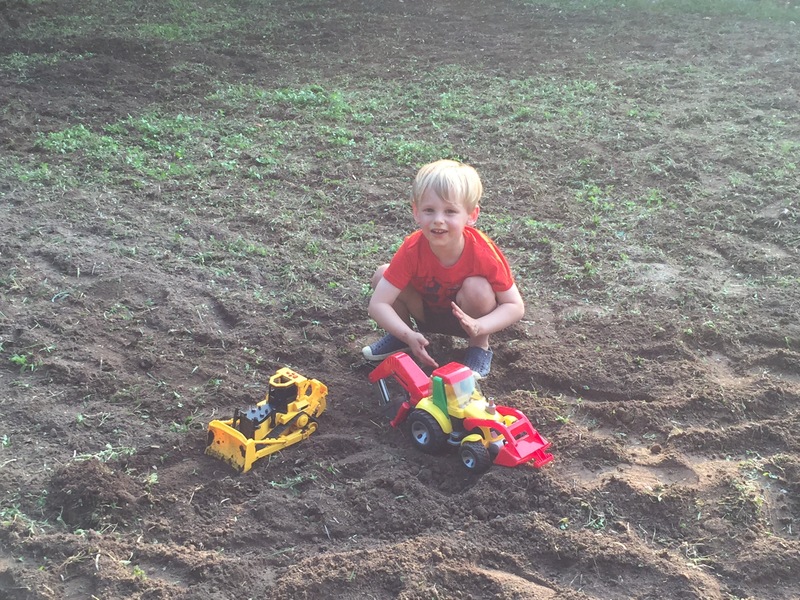 Then, the seeds were sown across the dirt and on the days it didn’t rain, the sprinkler was turned on. 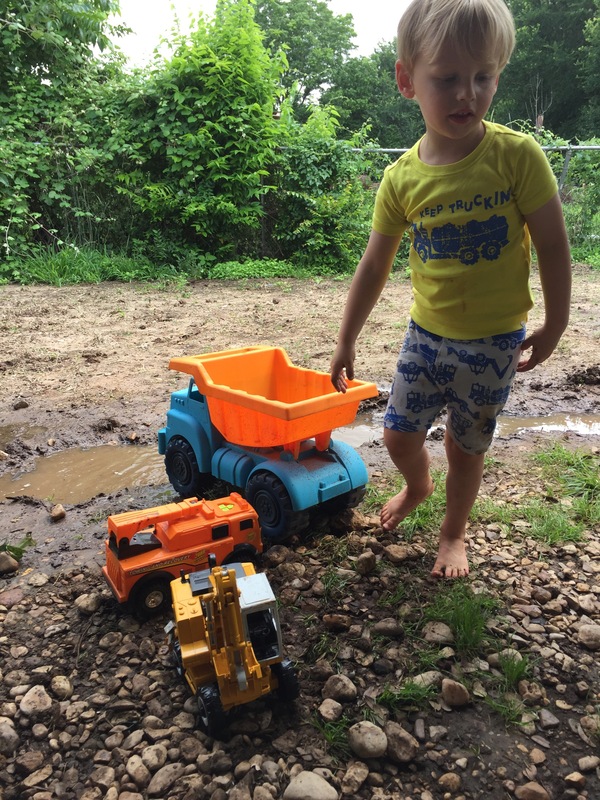 The trucks also got a washdown every day. In just a few short weeks, the grass started coming up and we had a beautiful new native approved lawn! It was such a success, plans are underway for the front yard! Obviously I love getting outside, being in nature under the blue sky, whether trail running or hiking, swimming or sitting in a river, playing golf, or just a short walk around the neighborhood, anything outside makes mama happy. But, I’ve definitely been embracing it more lately to get through the early weeks with a newborn. The first month was hard – screaming and crying baby and mama. How did I forget all of this hard work, or is this new little one just a higher need kiddo than the first one? After nights of the little babe staring back at me refusing to go to sleep, I stepped outside with her and stared at the green grass and bushes from all the rain and heard chirping birds and the wind blowing through the trees. This calmed us both down enough to make it through another night and day. During these first days of getting to know the little girl, getting outside was a vital part of the day. My breakthrough for coming back to life after popping out the baby was a beautiful hike on the greenbelt one morning when she was about two weeks old. My world opened up once El Nino went away and it stopped raining. I figured out how the Baby K’tan worked and hit the trails. On an early morning hike on the Barton Creek greenbelt, I saw a movie filming and sat and typed a draft of this post sitting on the rocks next to the water with the baby sleeping in the carrier. During this hike I realized that little girl just likes to be close to her mama and loves being outside. No more screaming during the day! Only took us two weeks to figure that out, and man what a long two weeks. After that hike I ventured outside nearly every morning with the gal around the neighborhood, on Lady Bird Lake trail with the jogging stroller, or hikes on the greenbelt and then spent a lot of afternoons porch sitting and watching our new native landscaping grow (more on this adventure later). It turns out there are is a lot of research on the benefit of getting outside for babies, it can even help them sleep better at night. 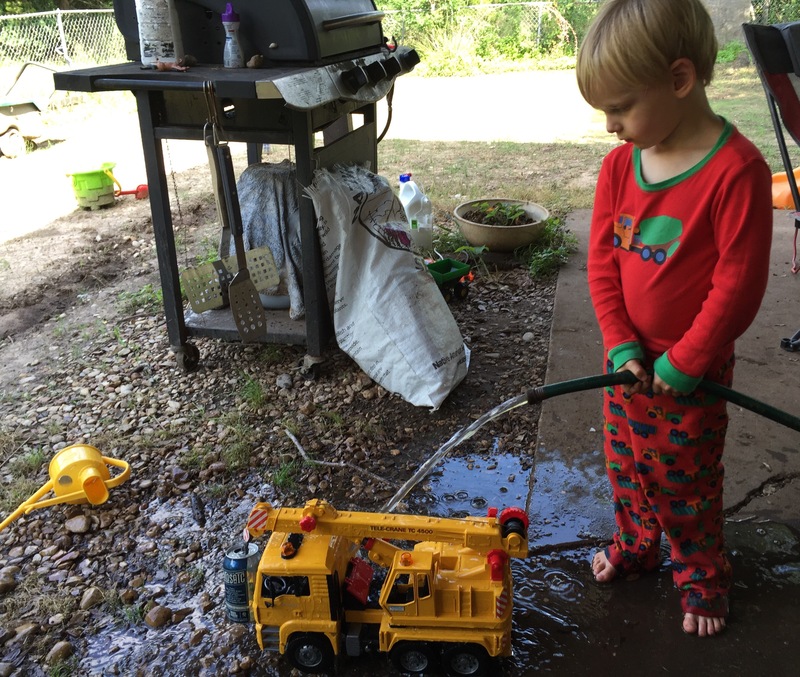 Here are a few good articles with more info on the power of being outside for babies and outside activities with infants. 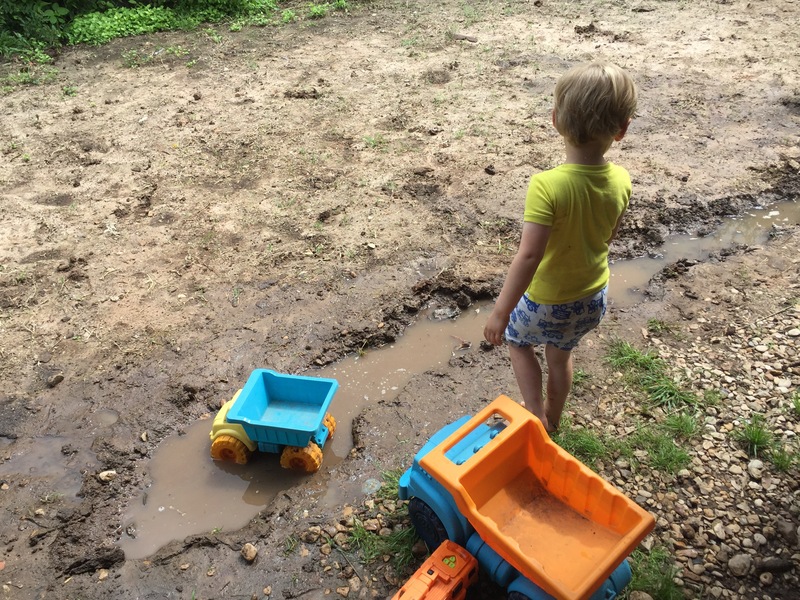 Here’s what I offer as keys to getting outside with a little baby. Take it easy, be flexible and find a good carrier and jogging stroller and don’t forget a blanket for a picnic. What about being outside makes you happy? Find your river, find your mountain…. Happy New Year! It’s 2016 – as some have been calling it Sweet 16. As you take a look at what you want to accomplish this year, I encourage you to find your river, find your mountain, or any adventure no matter how big or small. Driving into work the other morning I heard the song, Find your Mountain, by The Steel Wheels, an Americana roots band from the Blue Ridge Mountains and I heard the lyrics, find your river, find your mountain….and I started thinking…. So much of adventure books and outside adventure is focused around rivers, mountains, lakes, oceans, or other big features in nature. Last year I focused on reading more about these adventures – epic stories of kayaking down entire rivers and thousand mile hikes across mountain ranges – stories of internal struggle and self-discovery and stories of pushing physical bodies through extreme weather and conditions. From the Appalachians to the Seven Summits, there are so many opportunities for grand adventures in this beautiful world. I love the idea of undertaking a major journey or two or three like this in my life, but my daily reality right now (having a three year old and expecting his little sister in a few months) is not where I’ll be taking a three month quest down a river or trek across a mountain in the next few years. But, I don’t want to miss out on adventure opportunities. That’s why I love the idea of a microadventure. Coined by a British explorer, Alastair Humprehys, who has explored all over the world, a microadventure is the concept of getting out to explore close by in an easy, accessible and inexpensive way. One of the best parts of his book I like is the concept of using your 5 – 9 to have an adventure. At first I thought it meant 5 p.m. to 9 p.m., but soon realized in reading his suggestions that he meant 5 in the evening until 9 in the morning. While this may be difficult with work and traffic, I love the concept. Honestly though, even a four hour outside adventure from 5 – 9 p.m. is a great way to have fun during the week and get outside. You could easily get a short hike and picnic at a park and be back home with plenty of time before a late bedtime. There are so many options for this adventure – some people may like the lake, some are river rats, some are mountain lovers and others like a little walk by a creek. Whatever your favorite place in nature is or your daily reality, for this year I get outside more in big or little ways. Find adventure in your back yard or through life changing journeys across this beautiful world. Here’s to a wonderfully sweet 2016 of adventure to you all! Panoramic pics taken by Will Dupuy on our journeys outside to the rivers and mountains. Happy Holidays! I’ve had so much to be thankful for this year, especially over the last few months. I wish I had posted more recently, but life has been full of busy moments outside, at work and in our little house. Sunday morning runs on the beautiful boardwalk with my friend Whitney. Sleeping outside at my friend’s cabin with my boys under the bluffs of the Hill Country in the Medina River valley. Additionally, I’ve spent a significant amount of time the past few months learning more about the incredible migratory journey of the monarch butterfly. This fall, the butterflies made their yearly migration back to Mexico and I was honored to volunteer at two events for Texan by Nature, a conservation organization founded by former First Lady Laura Bush, that coincided with the butterflies return south. In early October, the annual gala for Texan by Nature was held at the president and Mrs. Bush’s ranch in Crawford. It was a beautiful day set in a restored native prairie to support conservation efforts across the state – the monarch butterflies even arrived to help celebrate conservation. Here is a group shot of the Texan by Nature advisory council that helped out at the event. Later in the month, I attended a press event at the George W. Bush Presidential Center to announce a multiagency monarch butterfly conservation initiative. In November I decided to create my own butterfly garden in our back yard. BW helped plant wildflower seeds from Native American Seed. The rye grass seed we planted for nursery cover crop has come up and the areas he dropped whole cup full of seeds on is especially lush. Stay tuned for updates next year on the progress of our pocket prairie and native landscaping. To round out my fall of monarch butterflies, I watched the Flight of the Butterflies movie in 3D at the Bullock Texas State History Museum. The coolest part of the movie was seeing the elementary school kids reaching out for the butterflies that seemed to be flying right over their head thanks to the magic of 3D glasses. Even though it is too cold and wet outside right now in Texas to enjoy beautiful butterflies, I’m still learning and dreaming about nature by watching documentaries in the toasty warmth of my living room. I have several books and movies on my list to go for the next few cold and dark nights. I can’t wait until February to watch National Parks Adventure. Here’s to many adventures through stories in film and books inside the warmth of our homes and in the beautiful world outside in the new year! Usually our summers are spent playing in the beautiful rivers of the Hill Country. From the Pedernales to the Medina, we have many hours of memories sitting in the sunshine and bathing in the minerals of these special rivers. 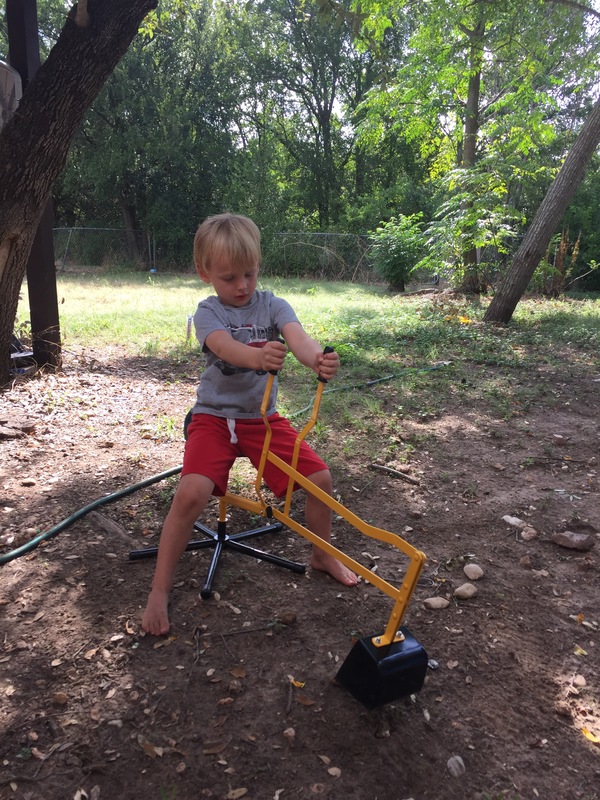 This year, with so much spring and summer rain in Texas, flooded rivers and cooler temperatures have kept us away from our summertime go to activity. We’ve been looking for other options to spend our time. Unexpectedly we found ourselves with a new toy, a trampoline in our backyard. Thanks to our friends who were moving into a new house and didn’t have room for it, we now have a full size trampoline to fill our days. BW loves jumping and dancing on it while listening to our neighbors music floating across the fence. 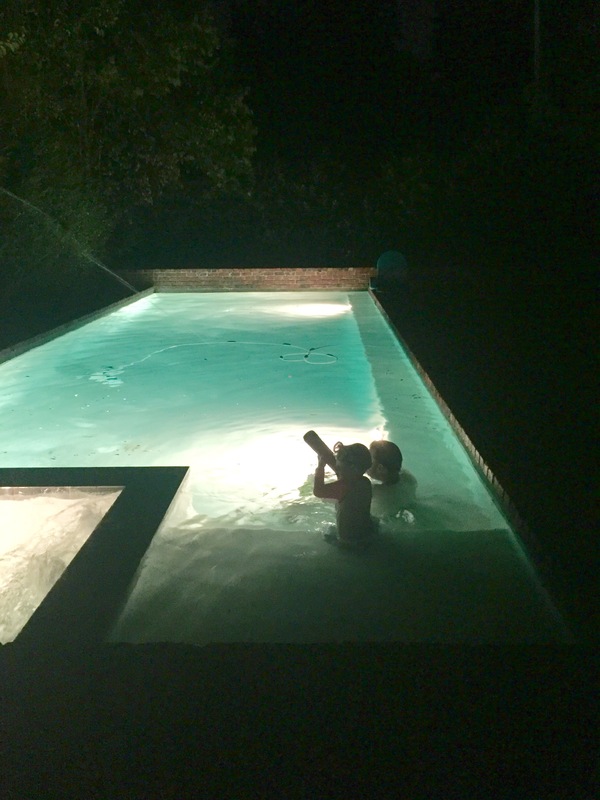 From first thing before breakfast to last thing before bed, this is hours of summer fun. It so reminds me of the long afternoons I spent when I was 8 years old jumping with the neighbor kids on their trampoline. There were no safety nets or adult supervision involved and our favorite thing to do was to jump on the trampoline with the sprinkler spraying on it. There is not much more fun in the backyard than a wet trampoline to slip and slide on. There is something special about time at the end of the day on a trampoline. As one of my friends told me, she and one of her friends solved all the world’s problems at 12 years old looking up at the stars from their trampoline. Looking up at the sky this summer from our trampoline we’ve already watched the wind dance through the trees, seen dragons in the clouds and frightened away scary monsters. One of the best days yet was playing on the trampoline followed by aswim in the neighborhood pool and then a long nap. Does a lazy day of summer get any better than that? 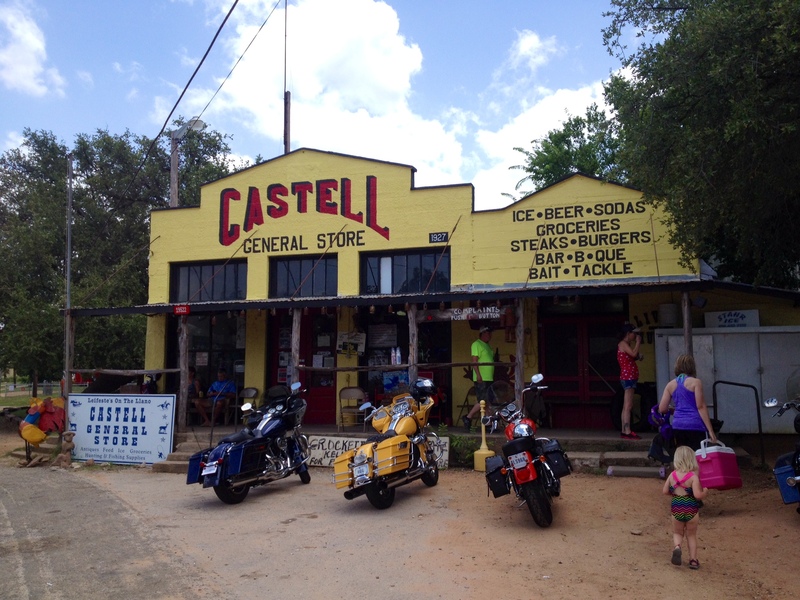 We finally did make it to the river, a short dip in the Llano river at the Castell crossing followed by steaks at the Castell General Store with the cousins. Another unforgettable lazy summer day. Ya’ll, it is cold out there, way too cold for mama to get outside. Before BW, my favorite cold weather activity was to bundle up, stand by a fire and drink a little whiskey. While I still do that every now and then, I’m finding new ways to spend time on cold days. On some cold and rainy days, we sit inside and watch Thomas the Train and the Blue Mountain Mystery over and over again. Although Netflix is the best $10 I spend every month, we have to take a break from it, we both get grumpy after sitting for too long. So what’s a momma to do, especially since I’ve never been very crafty? My solution – Super fun 30 minute clean crafts! These are the only types of crafts I tackle – easy to do, easy to clean up and usually have some type of use or have ingredients that are found around the house. 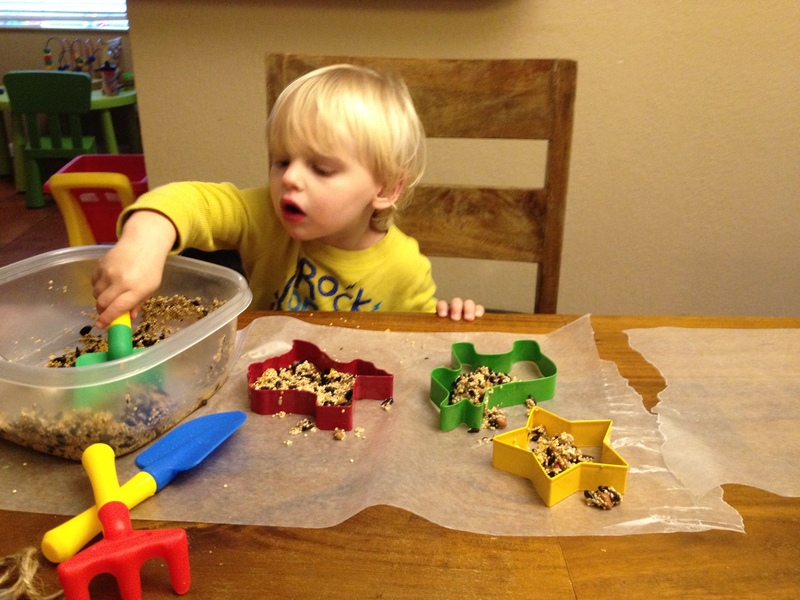 After I quickly blended unflavored gelatin with birdseed, BW had fun filling cookie cutters with birdseed. 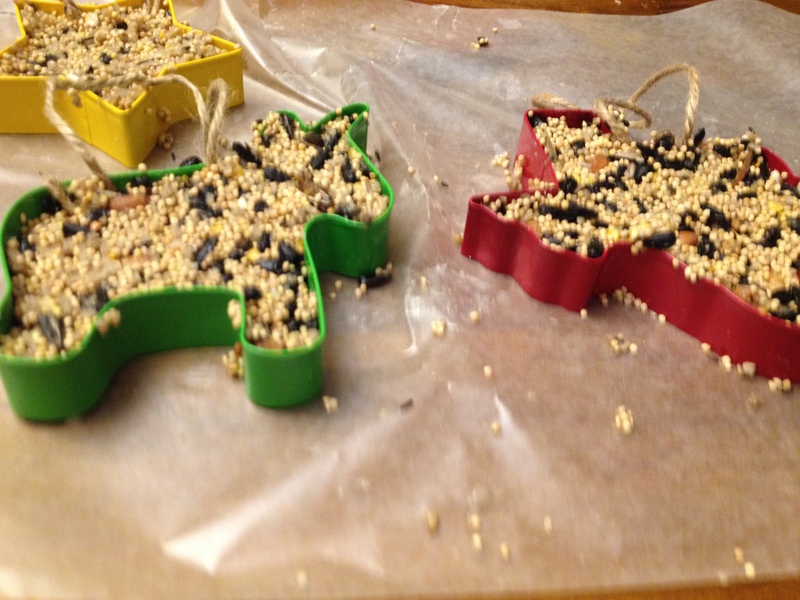 Thanks to my friendly neighborhood HEB, we made Texas themed feeders – a star, Texas and a donkey. 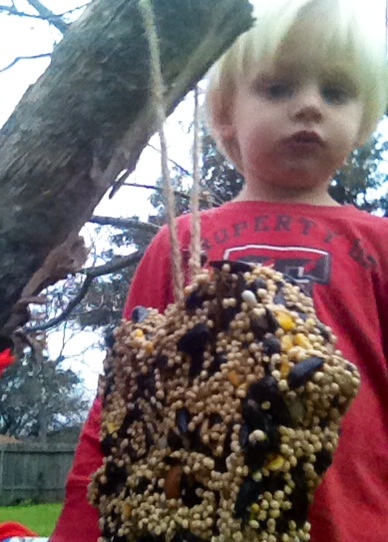 The next day after they dried, we ran out into the cold to hang them up for the birds. Apparently, only the squirrels ate them this time, so we’ll have to make them again for the birds when it is a little warmer. 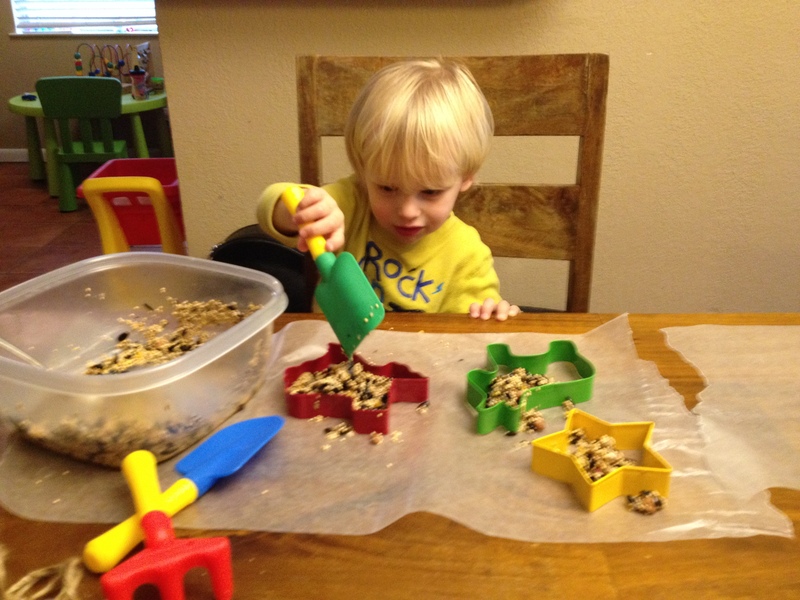 If you have ideas for indoor fun, please share or give me ideas for outside kid-friendly fun when it is cold outside. Ya’ll stay warm!